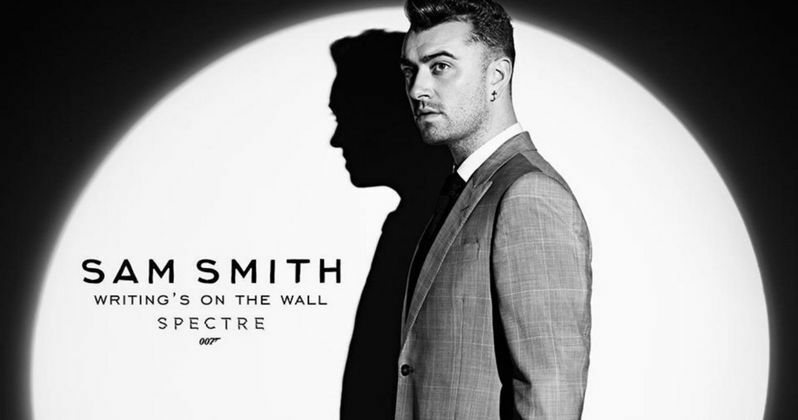 Albert R. Broccoli's EON Productions, Metro-Goldwyn-Mayer Studios, and Sony Pictures Entertainment today confirmed that Sam Smith has recorded Writing's On The Wall, the theme song to Spectre, the 24th James Bond adventure. Spectre will be released in the UK on October 26 and in the US on November 6. The song, released by Capitol Records, will debut and be available to purchase and stream on September 25. Multi-platinum selling artist Sam Smith has co-written the title song, "Writing's On The Wall," with fellow GRAMMY® Award winner Jimmy Napes. It is the first James Bond theme song recorded by a British male solo artist since 1965. Smith's debut album In The Lonely Hour launched at No. 1 in the UK and bowed in at No. 2 in the US, and has since earned five No.1 UK singles, four GRAMMY Awards, three Brit Awards, six MOBO Awards, Q and AMA Awards. Commenting on the announcement, Michael G. Wilson and Barbara Broccoli, the producers of Spectre, said this. "Sam and Jimmy have written the most inspirational song for Spectre and with Sam's extraordinary vocal performance, 'Writing's On The Wall' will surely be considered one of the greatest Bond songs of all time." Sam Smith said the following. "This is one of the highlights of my career. I am honoured to finally announce that I will be singing the next Bond theme song. I am so excited to be a part of this iconic British legacy and join an incredible line up of some of my biggest musical inspirations. I hope you all enjoy the song as much as I enjoyed making it." The 23 previous James Bond theme songs make up some of the most memorable movie music of all time. The previous Bond theme song, Skyfall was performed by Adele, and was honored with the Academy Award and Golden Globe Award for Best Original Song, the Brit Award for British Single of the Year, and the Grammy Award for Best Song Written for Visual Media. Related: James Bond 25 Begins Secretly Shooting in Norway? As Bond ventures towards the heart of Spectre, he learns of a chilling connection between himself and the enemy he seeks, played by Christoph Waltz. Sam Mendes returns to direct Spectre, with Daniel Craig reprising his role as 007 for the fourth time. Spectre is produced by Michael G. Wilson and Barbara Broccoli. The screenplay is by John Logan and Neal Purvis & Robert Wade and Jez Butterworth, with a story by John Logan and Neal Purvis & Robert Wade. Spectre is set for release in the UK on October 26, 2015, and in the US on November 6, 2015.